A large bird swoops down in the darkness and lands on a fence post. His stocky body might give him away, but it's difficult to see in the darkness. Then he raises his tufts to an erect position and his silhouette is unmistakable -- the mighty owl has landed. Scientists believe the tufts serve several purposes, though not necessarily the function many people suspect. Owls have excellent hearing, and can even hear prey hiding in snow. 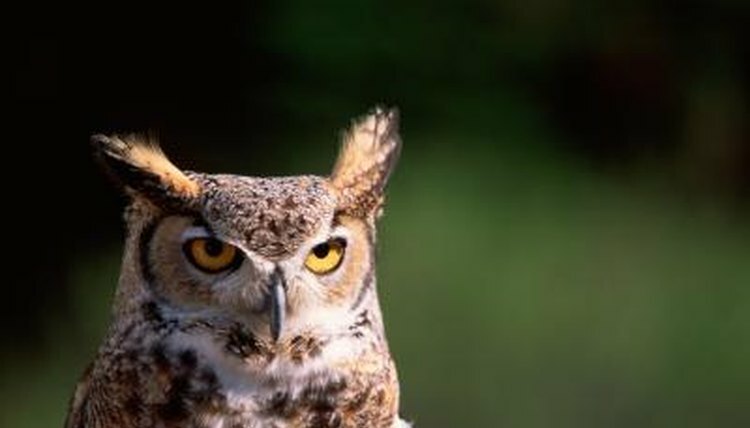 Studies of owls' brains show the medulla, which is associated with hearing, is much larger in owls than in other birds. Their keen sense of hearing has nothing at all to do with the tufts on top of their heads, however. Owls' ears are located on the sides of their heads, behind their eyes. Though the tufts resemble ears, and are often called "ear tufts," they are really just tufts of feathers. The mottled coloring of owls -- ranging from brownish to grayish -- helps them hide in the trees in which they nest. Sometimes, though, their round facial disks can give them away. When they raise their tufts, however, it breaks up the circular face so it's not as obvious. Perched on a branch, leaning in to the bark, the similarly colored tufts help them blend right in so it's difficult to tell an owl is hiding there. On the other hand, raising their tufts when they're out in the open helps owls keep track of one another without shouting their locations to enemies. Different species of owls have tufts that are shorter or placed at differing distances apart. Some species have no tufts at all. So pairs of owls instantly know which one is their mate, and families can easily keep track of the whereabouts of their kin. Raising their tufts is a way of saying, "Here I am," without vocalizing so others can hear. Many birds puff themselves up to appear larger and scare off their enemies and rivals. Owls with tufts can do better than that. By raising their tufts, they look taller and more fierce, warning enemies and rivals for potential mates to "back off; don't mess with me." The location and shape of tufts help scientists and bird-watchers identify different owls. The large owls with large, raised tufts at the edges of the tops of their heads are great horned owls. Their tufts, too, are just feathers, not horns. Their coloring can vary depending on locale -- ash gray in the Pacific Northwest, brownish in the southwest and nearly white in Canada -- but the large, widely spaced tufts still identify them as great horned owls. While the large horned owl has similarly large tufts, they're placed closer together on their heads. Great gray owls, barn owls and barred owls have no tufts at all. What Is the Purpose of Stripes in Zebras?